Every year, a couple of days for the actual opening, there is a official opening at Keukenhof. 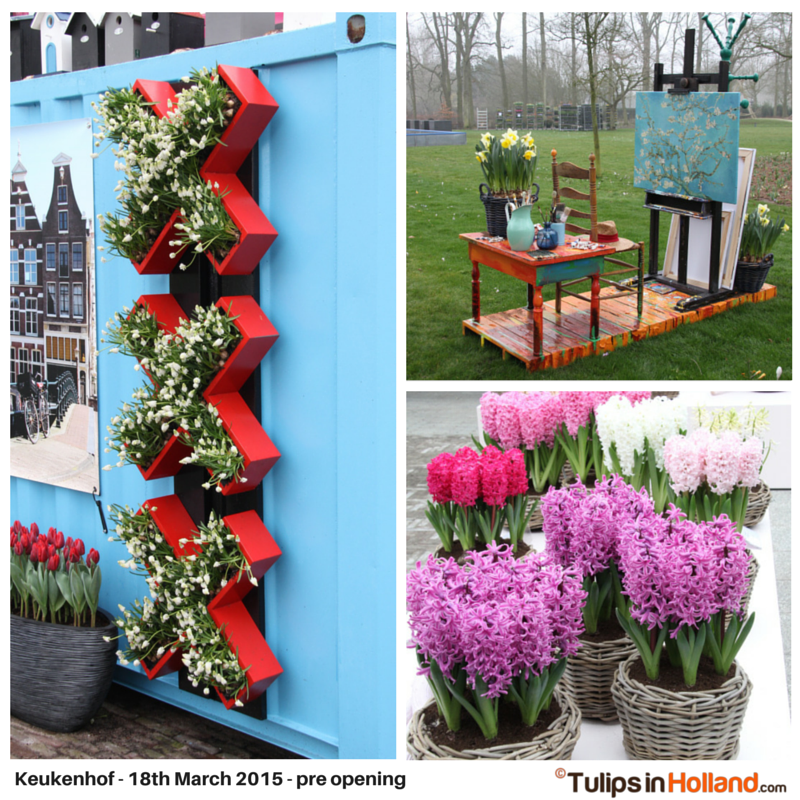 Guest and press are invited to hear everything about all the new things at Keukenhof. We can walk around to see how the park looks like and there is an official program for the opening. The real opening for the public is this Friday the 20th of March (2 days left!) For every one traveling in the next weekend I shot some preview photos. As you can see the crocus are in bloom outside at Keukenhof and yes the red color are some early tulips! There are a lot of beautiful inspiration gardens. Like the Amsterdam canal house garden (with Canal bike!) and a lovely new selfie garden. Please visit the new greenhouse with a lovely view at the flower fields where you can have fresh mint tea and carrot cake! Celebrate the Vincent van Gogh year throughout the park and spot Miffy /Nijntje in a flower mosaic! And for kids the petting zoo and the maze are renewed and there is a new scavenger hunt. Indoor a lot of flowers are in bloom: 75.000 tulips in over 600 varieties. 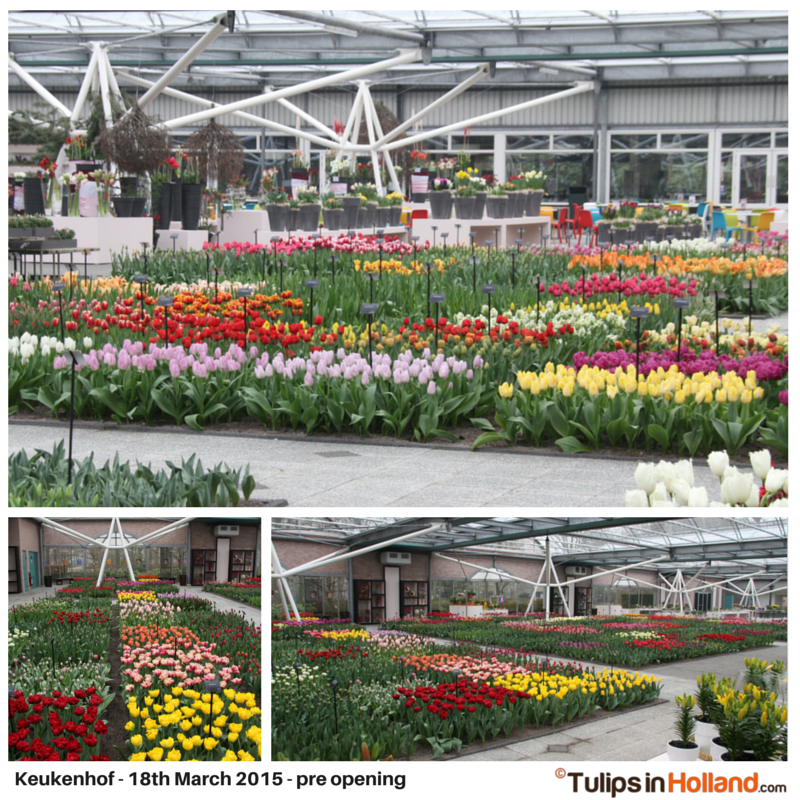 They will be in bloom over the next 2 weeks so make sure you visit the Willem-Alexander Pavilion. As you can see it was cold and grey today! Hopefully the weather will be sunny this Friday to welcome all the visitors from all over the world. Do you want to see more photo’s? Have a look at my Flickr photo page. My husband and I will be arriving in Amsterdam next Friday, March 27th. Cannot wait to see the lovely gardens at Keukenhof! So excited! Thanks for all of the lovely photos! i was went to saw the beautiful flower garden from France 26th July 2015at lisse but I was unhappy because I saw nothing but now I am determined next year I will go But when…..please anyone help me. Hi, I am a visitor from Hong Kong. I am planning to travel in Keukenhof. Is it possible to see the tulip blossoms in early May? or shall I go earlier, say last week of April? At this moment we expect the tulips in the fields to be in bloom around the 2nd/3rd week of April. Generally speaking during regular springtimes the last two weeks and the first week of May are the best time to see the tulips. Around the 30th of April (just after peak blooming) some farmers start with the topping of the tulips. It all depends when the tulips are exactly in bloom. That moment in time is different every year and depends on the weather and temperature during winter or spring. At this moment the daffodils and crocus are just in bloom. We expect the tulips from 2nd/3rd week but we are not sure. It can be earlier due lots of warmth and sunshine, or it can be slightly later. If you want to travel in May I would only the very beginning of May due to the topping in the fields. You’re welcome! 🙂 Have a wonderful time! I will visit on 3rd April. Are the tulips in bloom now? What is the current status? See our blog for the latest blooming information. Wednesday we will have a new update. 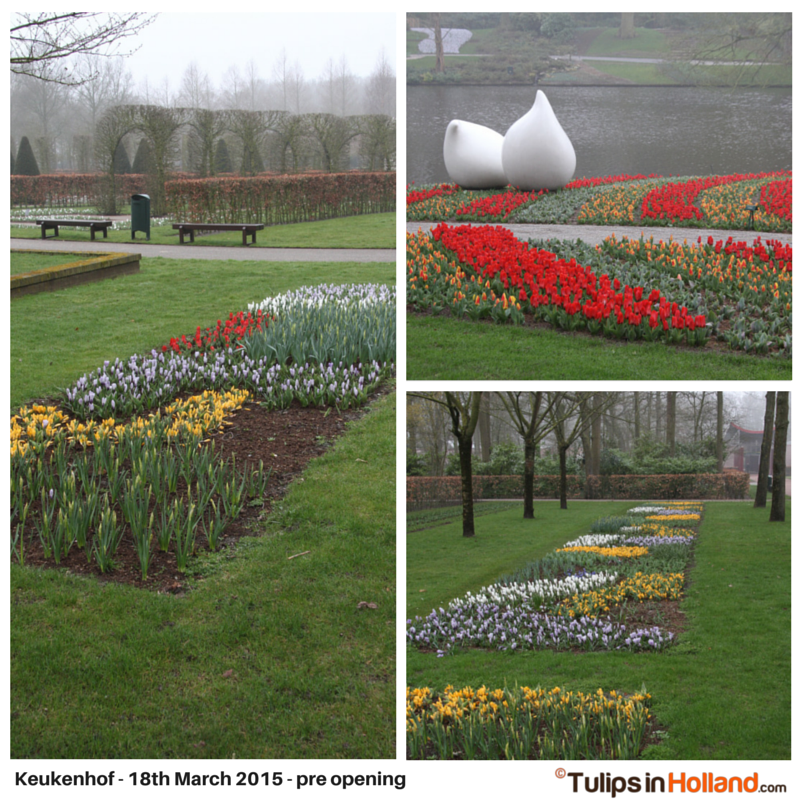 It’s great to have updating of Keukenhof 2015. I’ll be there 2nd of May. Can’t waitttt!